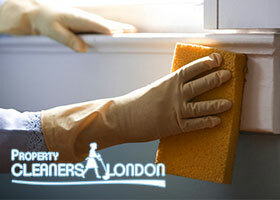 Every renovated property needs to undergo a deep and profound cleaning. However, not everyone knows how to remove glue stains and paint marks. We are the cleaning company in North London that understands completely the importance of a professional after builders cleaning and our competent cleaning experts are at customers’ disposal around the clock. Cleaning post builders may be difficult for someone but not for us. We operate in this field for years already and all cleaners in our team are old hands in after builders cleaning. Thanks to their hard efforts, the amount of our satisfied customers is increasing constantly. Let us help you get rid of the post-construction chaos and make your home clean and sanitised. Especially for the needs of our clients, we have developed a package that includes all must-perform procedures after a renovation project. In the services that we offer you is included a comprehensive cleaning of the kitchen and the bathroom, removing dust from furniture, mirrors, pictures and all surfaces, hoovering the carpets, washing the hard floors, cleaning the internal windows, the window frames, the skirting boards and much more. What are your benefits of working with us? Give us a chance and you won’t regret. We know how important is for you to live in a clean and sanitised environment and we won’t let you down. From us you can expect only pristine cleaning results, loyal attitude and personal attention. With us you don’t need to worry about quality because we collaborate only with experienced and skilful cleaning experts. In order to contribute to the efficiency of their work, we supply them with professional cleaning equipment. All of them are fully trained and use specialised cleaning methods, which allows them to deal with all kind of persistent stains and ensure the highest level of cleanliness. We are famous for our excellent after builders cleaning in the whole North London. If you also need help with the cleaning of your renovated property, don’t hesitate to contact us. Just dial our number and our office assistants will guide you through the booking form.